I love noodle soups, especially Chinese Chicken and Corn Soup with wide noodles. There’s something satisfying about slurping wide slippery noodles. In Asia, making loud slurping sounds while eating noodles shows that you are really enjoying your meal. In comparison, our western culture deems it rude to make slurping sounds at the table. At our house, staying true to Asian tradition, when eating noodles it would be rude NOT to make slurping sounds! We all live such busy lives, and sometimes it’s hard to make tasty food quickly. I’ve discovered that using store-bought rotisserie chicken, ready to eat, makes it easy to make home-made soup. Of course, with proper planning, it’s always best to make chicken stock from scratch using bones. After I shred the chicken, I always throw in the bones and carcass into my stock. 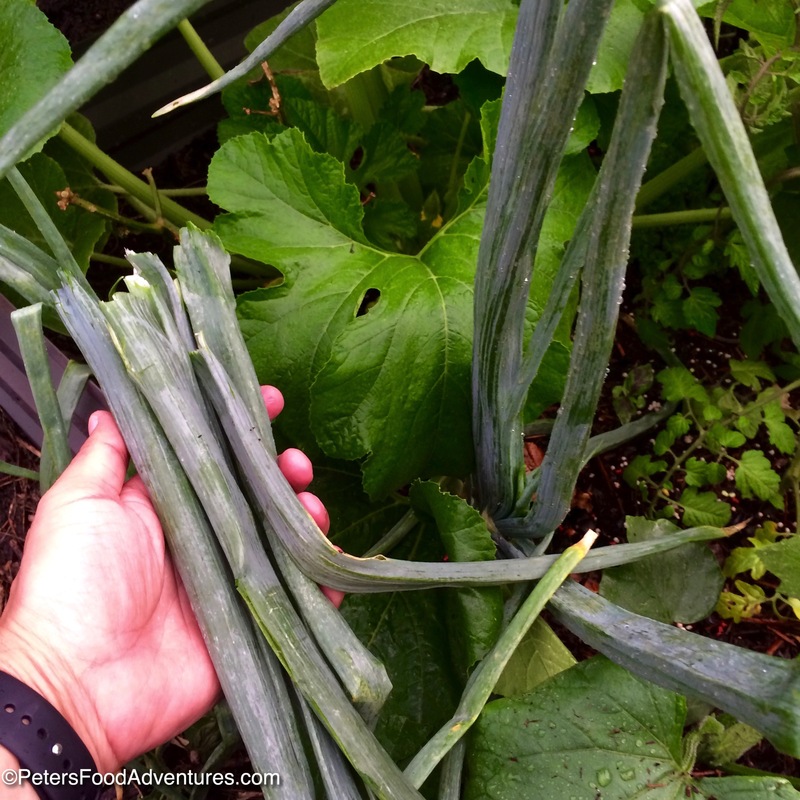 It’s quite easy to make your own stock, with a recipe found here. But in a rush, buy real chicken stock made with real chicken. 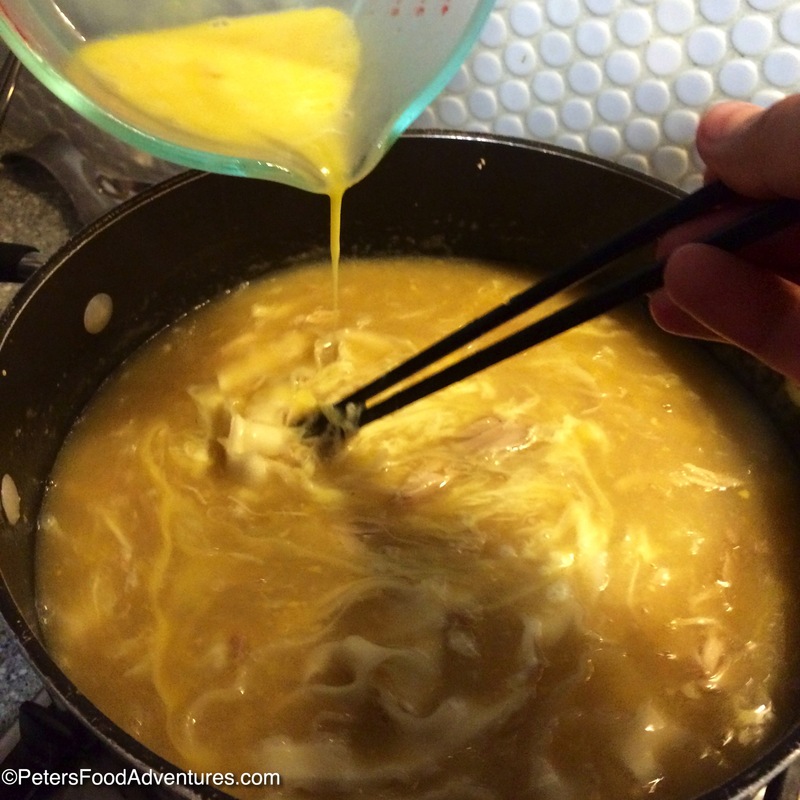 I was surprised to learn that there is chicken stock made without any chicken base. It just doesn’t taste the same, nor have the same nutrients that real stock provides. If you buy the soup stock, you can throw this soup together in 30 minutes. 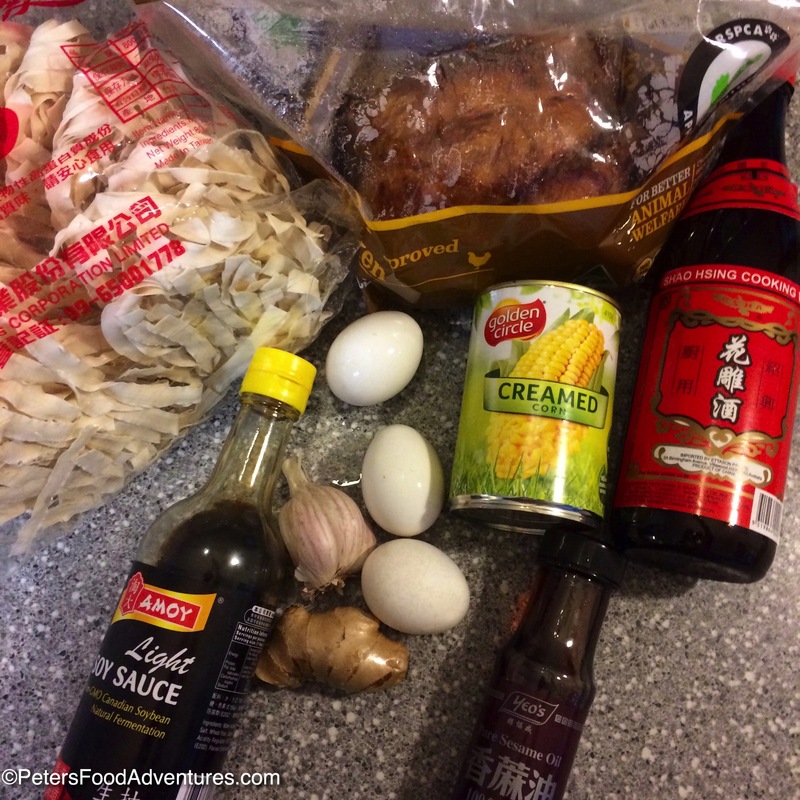 This Chinese Chicken and Corn Soup recipe is super easy and full of flavour. Once you figured out which stock to use, you just throw everything into the boiling stock, add the corn starch and eggs and you’re done. The eggs are probably the most tricky part of this soup. Just lightly beat the eggs, then slowly pour them in a steady stream, while constantly stirring the soup. The goal is to have thin ribbons of eggs that become part of the soup, not chunky thick pieces. When choosing your noodles, go to your local Asian grocer and find some wheat noodles which hold up great in soups. The package of noodles I chose didn’t have a word of English instructions on it, but I think they are Taiwanese in origin. Cooking Chinese noodles is basic, just drop, stir and cook for about 5 minutes. Chinese noodles tend to be quite thin and cook quickly, compared to their Italian pasta counterparts. I just looked for a wide noodle that looked appealing, and have used it ever since. But the time saving feature of this dish is the rotisserie chicken, cooked and ready to shred into your soup for meaty mouthfuls. This is a quick and easy soup, full of flavour and minimal fuss. Chinese Chicken and Corn Soup, an exotic meal that looks harder to make than it is, sure to impress your family. Bon Appetit! Приятного аппетита! Delicious Chinese Chicken and Corn Soup. Quick and easy to make and exploding with flavour, guaranteed to warm your soul. Made with a rotisserie chicken and Asian noodles, all done in 30 minutes. In a large stock pot bring chicken stock to a boil. Add garlic, ginger, soy sauce, sesame oil and the Shaoxing Wine to the stock and bring to a boil for about 5 minutes. 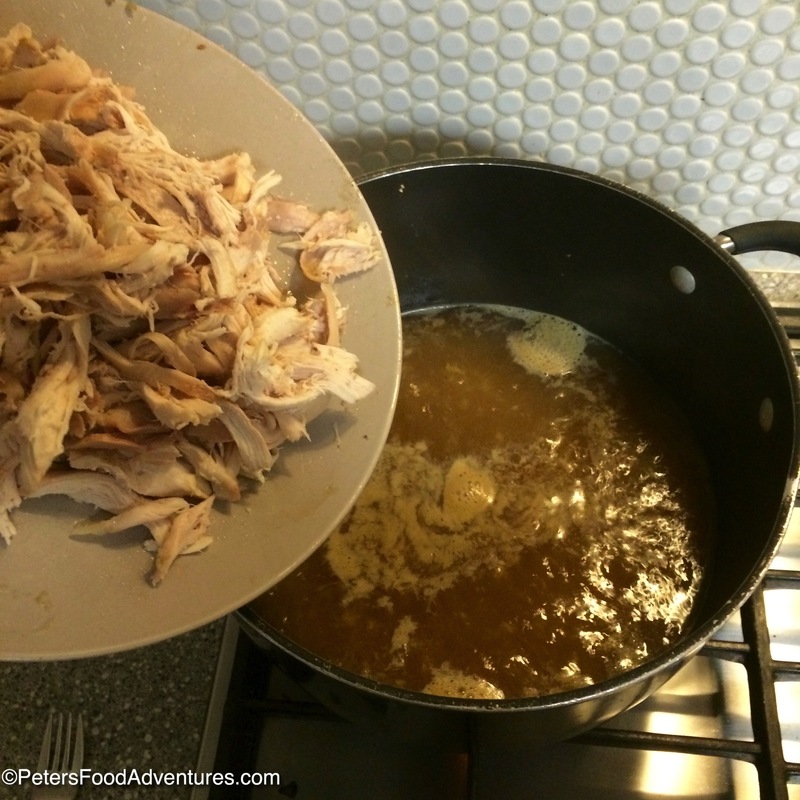 Add the shredded roast chicken and creamed corn and continue to boil over medium heat. Allow the soup to simmer for 10 minutes for the flavours to combine. Add Asian noodles to the soup and cook them according to instructions. Taste. Add a little more Soy, Shaoxing or Sesame oil if necessary. In a small glass, mix 1/4 cup water with the cornflour and stir into the soup to slightly thicken it. Add an extra half teaspoon of cornflour if you like the soup a bit thicker in consistency. Keep the soup simmering for the last steps. Lightly beat 3 eggs and slowly pour them into the soup in a slow steady stream, while constantly stirring the soup with chopsticks. If you pour the eggs in too quickly without stirring, they will clump together resembling scrambled eggs. You want the eggs to form into thin strands in the soup. Serve topped with thinly sliced green onions and enjoy! This is a large recipe, full stock pot! For a smaller portion, just half the recipe, then you won't eat leftovers for a week. Now getting hungry….. 2 in the morning though…. Your noodle made me soooooo hungry! Helloooo. That looks yumm and easy to make.. Surely gonna try it.. Thanks for sharing it.. ???????????? Thanks Neethu, and thanks for stopping by and checking it out! ???? Thanks! I think it tastes very authentic too! ??? ?